As an organizer for Atlanta’s Southern-Fried Gameroom Expo, I’ve gotten the opportunity to spend a considerable amount of time with Mr. Mitchell on the phone and in person. With the cameras removed, here’s a few things I’ve learned about the divisive legend. 1. He is an imposing beast of a man. When I first met Billy in person he wasn’t dressed in his recognizable suit and tie. Instead he wore athletic shorts, a golf shirt, and sunglasses—having just come from his son’s football camp. My brain almost couldn’t process the man removed from his uniform. I drive a small car, but when he sat in the passenger seat, he filled the car. At 6’3”, he casts a long shadow, and when you’re in his presence you see that his speech, his mannerisms and his expectations all fit someone who knows that no matter how insignificant his skills may be, he is the best in the world at something. 2. It’s not a mullet. Let’s get one thing clear here, folks. Billy Mitchell has a unique hairstyle, but he does not have a mullet. For Mitchell, it’s a party in the front and in the back. Though it may be an outdated style, it’s his and he owns it. He’s well aware that his luxurious locks make him instantly recognizable. When asked if he has any plans to get new haircut anytime soon, he shakes his head and says, “I promised myself when I was 40 I was going to get a shave and a haircut, and I guess I lied to myself.” And for the record, yes, his hair is even more glorious in person. 3. He’s never seen The King of Kong. Take it at face value, but Billy Mitchell still claims to never have seen the film which catapulted him further into the limelight. He said he doesn’t need to see it—he lived it. He’s aware that he’s portrayed as a villain in the movie and acknowledges the filmmakers certainly took some liberty in the editing room. Despite that, he is appreciative of the notoriety gained from The King of Kong and plays into the persona depicted on screen for public appearances. 4. He’s still really good at videogames, but only the classics. 5. Haters gonna hate, hate, hate. If you watched The King of Kong and came away thinking that Billy Mitchell was a gigantic egotistical jerk, you’re not the only one. Due to his notoriety and public knowledge of his ownership of a hot sauce company he frequently receives phone calls from numerous fans (including romantic advances from a few females), but also calls from his detractors. The really juicy calls? He saves those voicemail messages for future enjoyment. We probably spent close to half an hour listening to his greatest hits collection. From profanity-laden tirades to drunken harassment, Billy is all smiles the entire time as he excitedly scrolls through his phone to play me just one more misguided attempt at deflating his ego. Despite the nasty phone calls and all the online vitriol, he says he’s never had a negative face-to-face interaction. 6. His hot sauce rules. Though his family still owns the Rickey’s restaurant chain, these days his hot sauce empire is how he pays the bills and he loves the freedom it provides. “I can work or I can not work.” says Mitchell. Personally, Rickey’s Louisiana Hot Sauce reminds me a bit of Cholula. It’s more flavorful than it is hot, tastes great, and goes on practically anything. 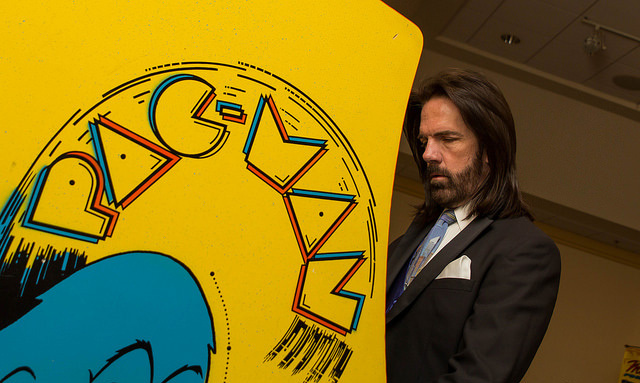 A personal highlight of mine is sitting with Billy Mitchell and Twin Galaxies founder Walter Day sharing a pizza at the close of last year’s Southern-Fried Gameroom Expo. Billy pulls a bottle out of his jacket pocket and douses his pizza slice with his very own hot sauce. As Billy passed the bottle around and I sprinkled some on my own slice and ate, I looked at his flowing brown hair and wondered to myself if this is what the Last Supper felt like. 7. If he wasn’t selling hot sauce or playing videogames, he still has plenty of options. Unlike videogames, this existence offers no extra lives. Too bad, otherwise we might get to see different versions of Billy Mitchell. Like his World War I namesake, Billy thinks he’d be a great fighter pilot. “Naturally, I’d change the world ‘cause I could get rid of all the bad guys.” Billy, recognizing his obsessive personality, also thinks he’d enjoy a life in the FBI where he would solve things because he’s very good at being methodical. For now, he’s just focused on being a great dad to his kids. 8. He doles out fantastic parenting advice. 9. Beyond the Billy Mitchell “character,” he’s really a nice guy. The best comparison I can make to Billy Mitchell is that he’s a real-life wrestling persona. 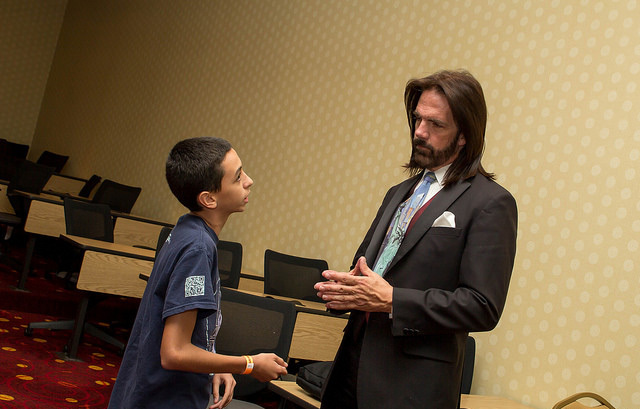 Instead of the “Mouth-of-the-South” Jimmy Hart, we get “King of Kong” Billy Mitchell. He makes every effort to verbally jab at his competitors and naysayers in public, all the while knowing this is exactly what people want to see from him. He is appreciative of all that his “celebrity” has afforded him and never passes up an opportunity to pose for a picture or talk to a fan. After trash-talking a competitor during a challenge, he’ll even break character to make sure his foe knows he was just kidding and making it all part of the show. When he’s in the three-piece suit with an American flag tie, you’re gonna get the imposing “King of Kong.” Though he doesn’t want anyone to know this, outside of his uniform, he’s just Bill: a regular business owner, a loyal friend, and a loving husband and father with a questionable hairstyle. Photos courtesy of Juan Jusino. Preston Burt always wants to know when there’s a kill screen coming up. He is a founder and organizer of the Southern Fried Gameroom Expo and has previously written for RETRO Magazine and the Screen Crush Network.